PHOTO BY JILL GOSCHE Carey's Trey Bame controls the ball against the defense of Columbus Africentric's James Hodge (left) and Tre Baumgardner during the regional semifinal game in Bowling Green Wednesday. 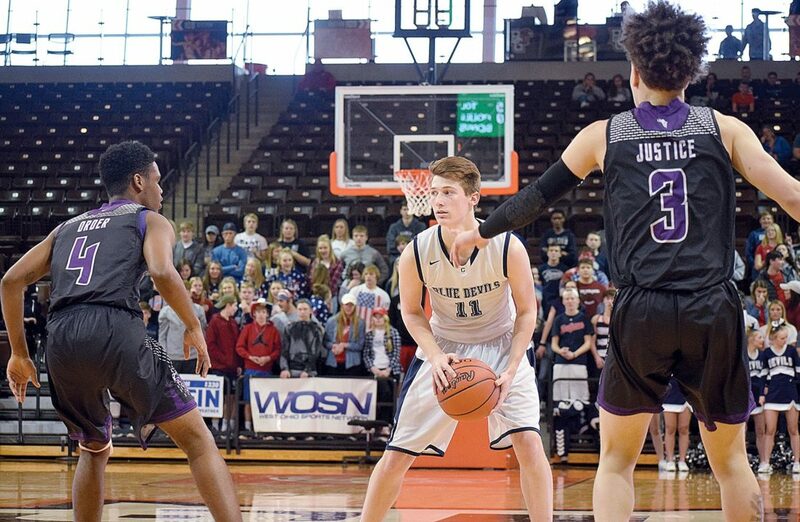 BOWLING GREEN – With about three minutes left in regulation and the outcome of Wednesday’s Division III regional semifinal between Columbus Africentric and Carey was long decided, Blue Devils coach Jamie Young took his starters out of the game. The Blue Devils were down by more than 20 points, and seniors Trey Bame and Cory Luzader walked off the court for the final time. This Carey team had won 20 games. It had secured the program’s first district title, going further than many expected. Before this season, the Carey seniors had never so much as one a postseason game. But if that heartened Bame and Luzader at that moment, they didn’t reveal it. The sadness of so much coming to an end — the postseason run, the great season, their careers — was evident. Africentric led nearly the entire game. Brayden Wentling’s 3 opened the scoring and gave the Blue Devils a 3-0 lead, but that was quickly countered by the Nubians’ Trey Baumgardner, who tied the game with a deep shot from the wing. It was the start of a 9-0 Africentric run. Carey fought back, getting within 11-8 on a Griffin Summit layup with 4:27 in the first, but the Nubians kept answering. They led 25-15 at the first stop. The Blue Devils turned the ball over five times against Africentric’s pressure, which often led to easy buckets. The Nubians starting the second quarter on a 6-0 spurt, attaining a 31-15 advantage when Lyheen Hillard converted a layup with 6:33 left until half. Carey inched closer on a basket by Casey Crawford and two Summit free throws, which cut the Africentric lead to 31-19. But the Nubians closed the half on a 6-2 jolt, and went to the break up 37-21. The Nubians controlled the paint in the first half, outscoring the Blue Devils 28-6. They also outscored the Blue Devils 25-0 between points off turnovers and second-chance scoring. “I think the most frustrating thing was, I just feel like, as a team, we kinda put our heads down in the second quarter, and let them extend their lead,” said Luzader, who finished with a team-best nine points. The Nubians really broke the game open in the third quarter, outscoring Carey 14-5. They started the quarter on a 10-0 run, putting the game out of reach. In the fourth, Africentric led by as many as 30, before some late baskets by the Blue Devils closed the deficit to the low 20s. Jah Bennett, a 6-foot-8 senior, had 21 points and seven rebounds for Africentric, with Bamgardner adding 15 points, five assists and four steals. James Hodge had eight points and eight rebounds. “We haven’t faced anybody like that in the four years I’ve been in this program,” Luzader said. “It’s an honor to play against a team like that this late in the basketball season. Africentric improved to 20-6, and will face Archbold here Saturday for a trip to Columbus next week. Carey finishes 20-7. It will lose seven seniors off this squad, including Bame, Luzader and Wentling, who were all starters. For Carey Hayden Stone finished with three points and six rebounds, while Griffin Summit tossed in six points and grabbed five boards. Logan Smiley finished with six points.